Organic India Tulsi green tea is a unique combination of tulsi and green tea, which helps in weight reduction. Studies suggest that green tea boost metabolism and helps burn fat. Key benefits: It reduces stress. Rich in antioxidants and other nutrients. It enhances stamina. It stimulates and revitalizes. It enhances respiratory functions. Direction of use: Take 3-4 times a day. 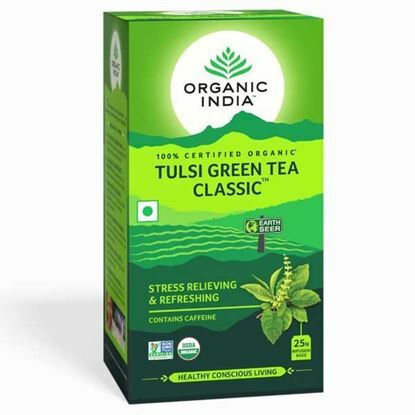 Organic India Tulsi green tea is a unique combination of tulsi and green tea, which helps in weight reduction. Studies suggest that green tea boost metabolism and helps burn fat.